The first in a series of live studio training events with Alan Parsons was held at the Universidad Nacional de Lanús (UNLA) in Buenos Aires on Thursday May 5th. 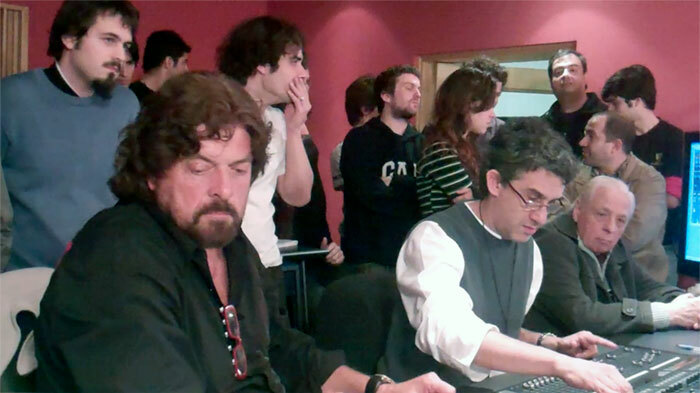 A concept initially explored by one of Argentina’s leading online music retailers Olimusic, the Master Class Training Session was timed to coincide with Alan Parsons Live Project tour dates in Argentina and Chile in early May and is sponsored by Argentinean distributors Sound Pro Latin America. 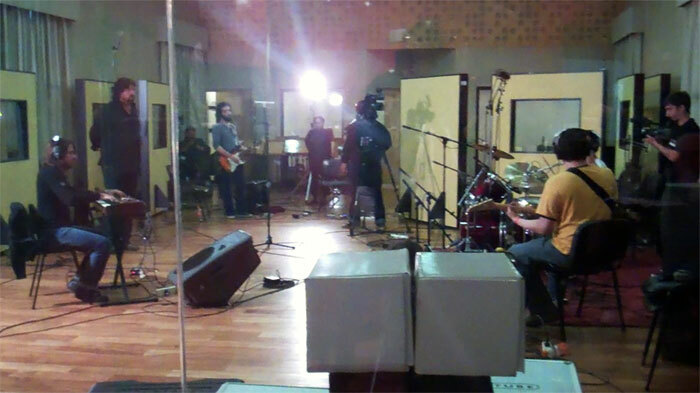 Over the course of the day Alan recorded a session with Argentinean band Vaqueros Paganos starting with live tracking, followed by overdubs including vocals and concluding with the basics of a mix. Thirty seats were available for a ringside seat with Alan in the pair of Yamaha 02r-equipped control room, with an additional 100 seats in an adjoining theater receiving a multi-camera video feed supplied by the university’s own video production department. Key stages of the event were also webcast live on Facebook. One of the biggest surprises was how much separation Alan was able to get between the instruments–comprising a full drum kit, bass, and two separate guitarists–simply by positioning amps and use of appropriate mics and polar patterns. Remarkably, given the fact that gobos were only used to minimize some ambience during the recording of the lead vocals, there was almost no spill between any of the instruments. Equally remarkably, in an almost 12-hour working day, Alan’s sense of humor and attention to detail never seemed to waiver. Reaction to the event was extremely positive, not only live and in person but also on the Twittersphere. @Federiqo tweeted, "Awesome Master class, thank you, thank you very much. And ty 4 the picture to hahaha." @clockworkbanda tweeted, "Great Class Alan, its a shame we couldn't learn all the stuff you prepared, but I'm honoured from being there! Cheers!" University director Susana Espinoza was equally thrilled with the event, saying that the day was a complete validation of her personal efforts in getting the UNLA’s impressive recording facilities built in the first place. The Universidad Nacional de Lanús is a public university (completely free to students) with more than 500 students enrolled in their 4-year audio and video production degree courses. Master Class Training Session dates in the U.S. are due to be announced later this month, starting in July.